Ithaca College students volunteer their time to commemorate the work of Martin Luther King, Jr.
With Ithaca College’s Martin Luther King Jr. Day celebration still resonating across campus, student volunteers came together to participate in a special MLK Day of Service event Jan. 24, which was organized by the Office of Student Engagement and Multicultural Affairs. Don Austin, assistant director of community service in OSEMA, coordinates all of the Service Saturdays with a small leadership team. He said this particular one follows MLK day, which is when everyone has had a chance to reflect on what King’s dream was really about, what it meant for many different people and how service fits into that. “We make sure we do a reflection [at the end of the event] to talk to folks about why is this important, how is service to the community important as a college student, as a community member, to see themselves as a community member,” he said. Sophomore Sharon Mejia said the MLK Service Saturday was really aimed at giving back to the community in the same way that Martin Luther King Jr. did. 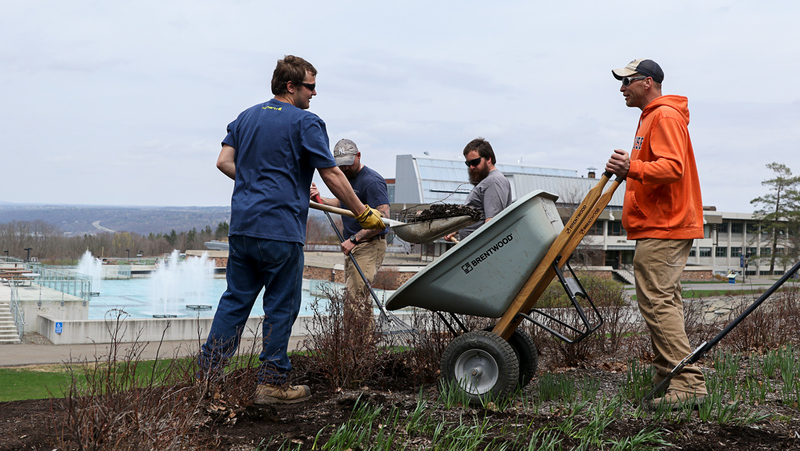 The college partnered with 11 organizations including The Salvation Army, Family Reading Partnership, Rescue Mission of Ithaca and Cayuga Ridge. At each of these locations, students gave a helping hand, whether it was through serving food or simply socializing with others. Senior Emily Massaro, also a student leadership consultant, said this particular MLK–themed program that was put together by OSEMA had a much larger turnout than all of the other Service Saturday events. She said it depends on the time of the year and the type of work the office can offer. However, typically they only offer about three different locations. She said the larger turnout could have been due to more awareness about this Service Saturday because of its connection to Martin Luther King Jr.
Massaro said the student volunteers used the ideals of Martin Luther King Jr. to further their service in town. “In remembering Dr. Martin Luther King and his mission, we kind of serve the Ithaca community today,” she said. Massaro chose to help out at Rescue Mission, which is an organization that provides different services for the homeless population in Ithaca, from giving them a warm place to stay during the day to providing them with some meals and housing on a more long-term basis. She said she, along with the other students that went to that location, helped with maintenance in the building and organized some of the rooms. Freshman Melissa Potter, one of the students who attended the Family Reading Partnership, said at this particular location, volunteers were stacking bookmarks that all had different ways parents could say “I love you” to their kids to remind them how much they are loved. Potter said participating in Service Saturday is a better means of using one’s time than doing typical weekend activities. Freshman Mara Erb, one of the students that attended Cayuga Ridge to spend time with the elderly who reside there, said she wanted to help at a location that involved interacting with other people. Austin said he hopes this particular event encouraged and gave them inspiration to join a club that has a service mission, to go on an alternative spring break trip or to get involved in a social movement or activist organization in the local community. “My hope is that it’s a catalyst, that this will be their first step and they’ll take it a step further,” Austin said. At the end of the day, during the reflection ceremony, each group elected one person to receive the MLK “NOW” Award, which goes to a person who has displayed an exemplary level of teamwork, a positive attitude and commitment to social justice during the event. The recipients of this award included freshmen Kiaira Anglero, Christopher Biehn, Katie Crewdson, Tate Dremstedt, Elena Haskins and Angela Pradhan, and sophomores Ashley Ahl, Julie Erickson, Kelli Kyle and Hayley Warren. Mejia also received the award and said it showed her that service is an experience that she has always loved and that it felt really good giving to the people who really needed it. “Martin Luther King Jr. gave back, and I wanted to follow his example and help inspire others,” she said.